The site is in East Brighton, in Whitehawk. 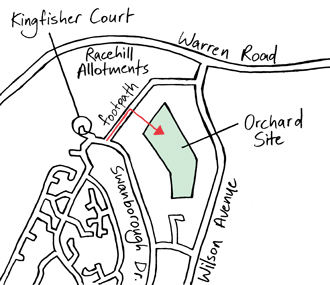 It is accessible from both Swanborough Drive and Wilson Avenue via a little path which runs next to Racehill Allotments, which you can see in the map below. When you go down the little path from either road, you will come across a smaller path opposite the allotment entrance into the orchard site. Go down here until you find other people. The blue line is the footpath. Parking is more convenient on the Wilson Avenue entrance. The 1, 1A or 21 bus has its last stop at Swanborough Drive. Bus route 2/2A/22 stops at Wilson Avenue.